graphene is the NanoTCAD ViDES class for graphene flake. As inputs, it requires the length of the graphene flake L expressed in nanometers. attaching semi-infinite leads through the definition of the self-energy ∑, while in the transversal direction periodic boundary conditions (Bloch conditions) are imposed. In particular, along the y-direction the flake is periodic with period ∆. n : (int) the number of atoms along the transversal direction. acc (double): Carbon to carbon distance expressed in nm. kmin (double): is the minimum value of the transversal wave vector in the Brillouin zone, over which the integral for the T and the charge is computed. By default it is set to 0.
kmax (double): is the maximum value of the transversal wave vector in the Brillouin zone, over which the integral for the T and the charge is computed. By default it is set to pi/∆. dk (double): the wave vector step used for the computation of the charge and the T.
charge : (numpy array of length n*Nc) free charge computed in correspondence of each C atom of the graphene. x : (numpy array of length n*Nc) the x position of the i-th atom of the graphene: it is set to 0. 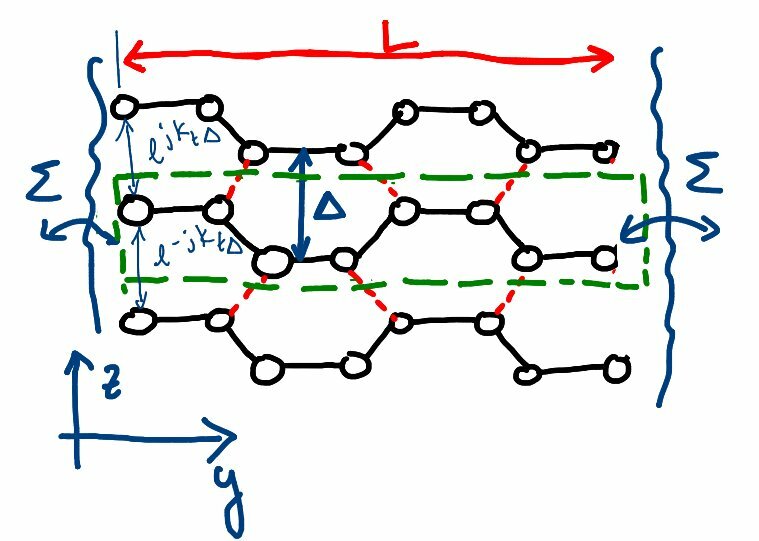 L : (double) the effective length of the considered graphene domain, which is the length of the graphene composed by a integer number of unit cells, closest to the length specified by the user. charge_T : (function) function which computes the free charge and the transmission coefficient in the energy interval specified by Eupper and Elower with an energy step equal to dE in correspondence of each C atoms of the graphene flake. Such a computation is performed in the real space. current : (function) it computes the current through the Landuer formula, once filled the T vector. gap : (function) it computes the energy gap of the nanoribbon: it is set to zero. This is required by the MPIze_kt command. rank : (int) the rank of the process in case the MPIze_kt command is used. See the tutorial on graphene for a clear undestanding of this class.